, son of the preceding, was born at Upsal in 1660, and under his father’s direction studied | medicine, botany, and antiquities. He took his doctor’s degree at Utrecht, in 1690, publishing on that occasion an able dissertation, “De fundamental! Plantarum Notiti-3. rite acquirenda.” In this he asserts the necessity of arranging and distinguishing the genera of plants by their fructification alone, and prefers such leading principles as are derived from the fruit, rather than from the corolla. He rejects habit, colour, sensible qualities, time of flowering, &c. on which so much stress has been laid by superficial observers; while, on the other hand, he declines being implicitly led by the more abstruse principles of certain more philosophical botanists. He had previously, at Upsal, in 1686, defended a thesis “De Propagatione Plantarum, 1 * which is less original, though highly creditable as a school exercise. 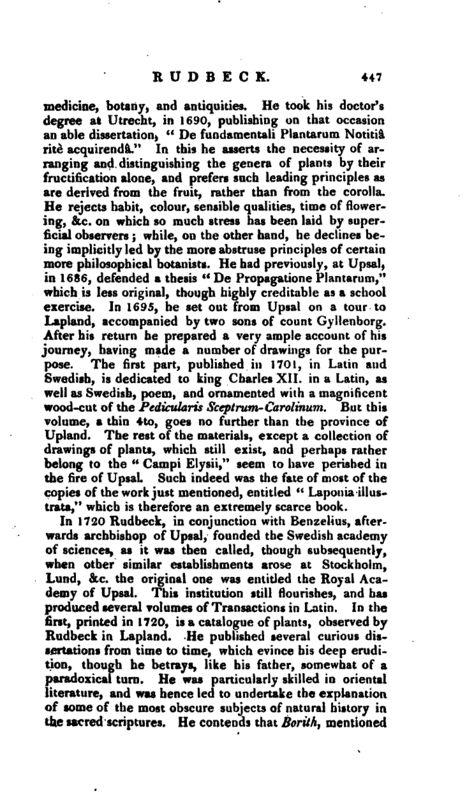 In 1695, he set out from Upsal on a tour to Lapland, accompanied by two sons of count Gyllenborg, After his return he prepared a very ample account of his journey, having made a number of drawings for the pur* pose. The first part, published in 1701, in Latin and Swedish, is dedicated to king Charles XII. in a Latin, as well as Swedish, poem, and ornamented with a magnificent wood-cut of the Pedicularis Sceptrum-Carolinum. But this volume, a thin 4to, goes no further than the province of Upland. The rest of the materials, except a collection of drawings of plants, which still exist, and perhaps rather belong to the” Campi Elysii,“seem to have perished in the fire of Upsal. Such indeed was the fate of most of the copies of the work just mentioned, entitled” Laponia illusr trata," which is therefore an extremely scarce book. 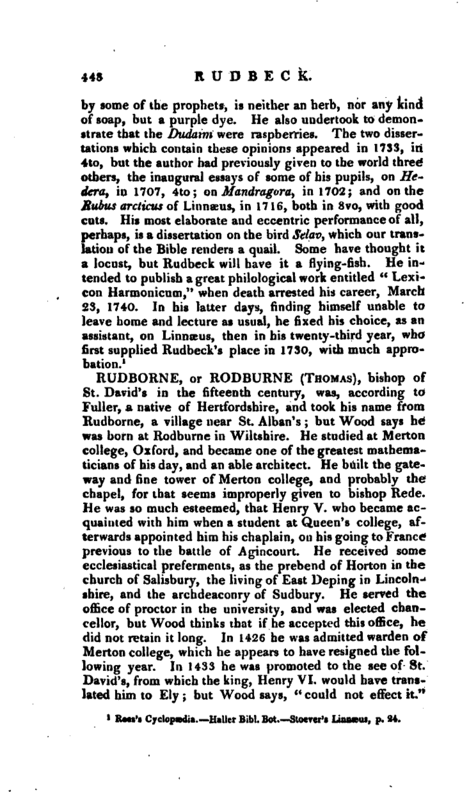 Rees’s Cyclopædia.—Haller Bibl. 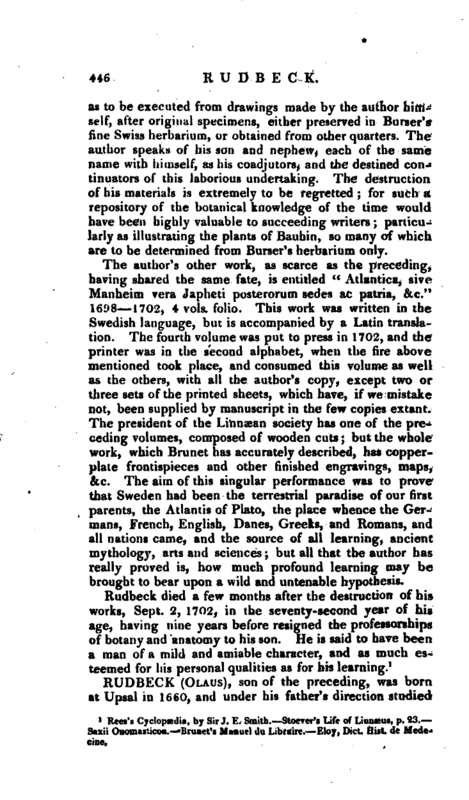 Bot.—Stoever’s Linnæus, p. 24.